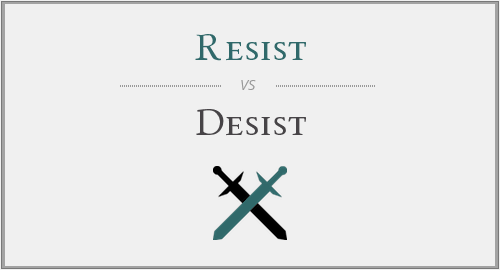 In this Grammar.com, let us explore the two words resist and desist, understand their differences and get a knack of using these through various examples. Enjoy reading this irresistible article, written in simple words. · I resisted myself from eating ice-creams as I had severe cold. · Don’t resist yourself from explaining your stand. · We are resisting the usage of corpus fund for bringing solar energy project in our society. · The resistance from students was too much for me too proceed with the speech. Resist is a synonym of refrain which means to move away from doing something that’s otherwise attractive or tempting. In the 1st example, we can use refrain as well. The word resist originated from the latin resistere, re meaning oppose, and sistere meaning to stop. Irresistible is something you cannot resist. For example, the desserts at the restaurant were irresistible. Resistance is the noun of resist. For example – our society has a strange resistance towards changes. · As a result of fierce opposition, the committee wanted to desist the project before completion. · He promised to desist chewing tobacco. · I desisted my son from meeting those naughty boys again. · They got a court order to desist from selling their products and services. · We told her to desist hurting herself with a knife, but she wouldn’t. Resistance can often lead to desistance. · The committee members resisted to the idea of bringing water cans to the society, therefore the motion to desist the supply was passed. · The company was asked to desist the production because the sponsors resisted from releasing enough funds. A cease and desist is a letter sent to a business or an individual to stop (cease) alleged illegal activities and not start it again (desist). It is essentially an order mostly given by a public authority for disputes related to intellectual properties. As we have seen, the words resist and desist sound similar but are quite different. One is to prevent an action and other is to stop it after it has been initiated. "Resist vs. Desist." Grammar.com. STANDS4 LLC, 2019. Web. 22 Apr. 2019. <https://www.grammar.com/resist_vs._desist>.